Fräulein Anna O. (Bertha Pappenheim) was the first of 5 patients treated for hysterical illnesses by Josef Breuer and Sigmund Freud and described in their seminal book 'Studien iiber Hysterie' in 1895. She was the first patient of the cathartic method, psychoanalysis, and dynamic psychiatry. Anna O participated in the creation of the "talking cure". 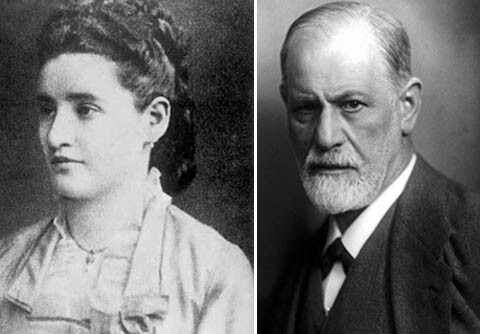 According to Freud Anna O. is the true founder of the psychoanalytic approach to mental health treatment. Anna O. was born in 1859. Her family came from Bratislava. Her father was a merchant in Vienna. Her mother, Recha Goldschmidt, came from an old Frankfurt family. They were well-to-do Jewish middle-class family. She had an uneventful childhood. At the time of her falling ill (in 1880) Fräulein Anna O was twenty-one years old. Her history was complex. She had been nursing her father who was ill with tuberculosis when her symptoms began. She nursed him but had to relinquish it when she became anorectic, weak, anemic and developed a severe, 'nervous' cough. In December 1880 Anna O. developed a convergent squint, 'mistakenly' attributed by an ophthalmologist to unilateral abducens paralysis (Abducens nerve palsy). She developed a left-sided occipital headache and complained that the walls of the room seemed to be falling over. She could move her head forward only by pressing it back-between her raised shoulders and moving her whole back. A paralysis - described as 'contracture' but later completely reversible - developed in the right upper limb, spreading to the right lower, left lower and then (partially) to the left upper limb. From December 1880 to June 1882 Dr Joseph Breuer saw her. Also he discussed her illness with Sigmund Freud. Breuer described Anna O’s personality, noting that the sexual element was astonishingly undeveloped. Despite early reservations and doubts he diagnosed hysteria. Hence Anna O. was treated for hysteria. Anna O. was a very demanding patient with insatiable needs. As devoted as Breuer was to her treatment, it appears that Anna continually demanded more, and soon Breuer was in over his head. Anna used threats of suicide and attacks on her body (exacerbation of symptoms) as ways of coercing Breuer into increased contact with her. As described by Dr Breuer, his treatment of Anna gradually developed through three stages, as he responded to Anna's own apparent wishes. In the first stage, he recognized that she could relieve her distress by making up and telling fairy tales, 'always sad and some of them very charming'—and he encouraged her to do so. She herself called this activity 'chimney sweeping' or her 'talking cure'. In the second stage, Breuer was able to hypnotize Anna every morning, sometimes by holding up an orange, in order to help her to remember some of the painful emotions she had gone through when her father was dying. Each evening Breuer would return and Anna would recount, with vivid emotion, the exact events from precisely one year previously. In the final stage, Anna began to add to these accounts a description of the various occurrences that had evidently triggered each of her hysterical symptoms during the previous year. What was her illness? In general Anna O. experienced "glove anesthesia" of her right arm and, partial paralysis of right leg, impaired vision, nausea, difficulty understanding her native language (aphasia). Her symptoms lasted about a year and a half and only went very gradually. However the case of Anna O. was neither a catharsis nor a cure as described. Anna O. grew up in a strict Jewish-orthodox family. She was entangled in a lifelong daughter-father conflict. Breuer thought that Anna fell prey, during her father’s final illness and in the months after his death. After her Father’s death she had another symptom – sleepwalking and also began to refuse food (anorexia?). She suffered in her youth from a conversion disorder. Her symptoms were triggered by her grief at her father’s illness and her mourning for his death. The suggestion that her disorder was neurological rather than psychological is unlikely given its outcome. Examination of the neurological details suggests that Anna suffered from complex partial seizures exacerbated by drug dependence, and that she developed conversion symptoms patterned after the preexisting organic pathology. Hysterical conversion symptoms that mimic ictal events are not uncommon in psychomotor epilepsy. Merskey (1992) suspected severe depressive illness with depressive delusions caused most of her symptoms. Some experts point out that Anna O. had symptoms following addiction disorder. They indicate that she was using extremely high doses of chloral hydrate (5 g a night) and morphine 100–200 mg per day. The medical researcher Elizabeth Thornton hypothesized that Anna O. had suffered from tuberculous meningitis. (Anna O. had a family history of tuberculosis. Her elder sister Henrietta died of tuberculosis in 1867 when Anna O. was 8 years old. Her father fell ill with a subphrenic tubercular abscess). Finally Anna O. overcame her symptoms. As a mature adult Anna O. became a leading social worker, writer, and feminist activist in the German Jewish community. Anna O. wrote extensively on social issues and women’s rights. Her most important book dealt with the need to protect women from prostitution and white slavery. She died in 1936 and buried in the Rat Beil Strasse Jewish cemetery in Frankfurt. In 1953 the British neurologist and psychoanalyst Ernest Jones revealed the identity of "Anna O. On the 50th anniversary of her death in 1954 the German federal postal service issued a postage stamp with a portrait of Bertha Pappenheim in recognition of her services. Freud, E. (ed) (1960), The Letters of Sigmund Freud. New York: Basic Books. Gilligan, S. G. (1983). Misrepresentation and misreading in the case of Anna O. Modern Psychoanalysis, 27(1), 75–100. Hurst, L.C. (1982).What was wrong with Anna O? J R Soc Med.;75(2):129-31. Kaplan, R.(2004).O Anna: being Bertha Pappenheim--historiography and biography.Australas Psychiatry.;12(1):62-8. Kimball, M.M. (2000).From "Anna O." to Bertha Pappenheim: transforming private pain into public action.Hist Psychol.;3(1):20-43. Launer, J. (2005).Anna O and the 'talking cure'.QJM. 2005 Jun;98(6):465-6. Merskey, H.(1992). Anna O. had a severe depressive illness.Br J Psychiatry. 1992 Aug;161:185-94. Nitzschke, B.(1990). [Prostitution wishes and rescue fantasies--flight from the father. Sketches from the life of a woman ("Anna O."--"P. Berthold"--Bertha Pappenheim)].Psyche (Stuttg).;44(9):788-825. Orr-Andrawes, A.(1987). The case of Anna O.: a neuropsychiatric perspective.J Am Psychoanal Assoc. ;35(2):387-419. Weissberg, M .(1993).Multiple personality disorder and iatrogenesis: the cautionary tale of Anna O. Int J Clin Exp Hypn. 19 ;41(1):15-34.